In the last few posts to this blog we’ve considered several ways to get games into a “Fritz family” (Fritz, Shredder, Hiarcs, Junior, Rybka) database, but there’s a major source of games we’ve not yet discussed. The Internet is a major chess resource, with hundreds of thousands of games, files, and databases available for download. But if you’re a regular visitor to chess websites you’ll often find games which aren’t downloads – just notation on a screen. While you could ALT_TAB back and forth between the page and your chessplaying program while you enter the moves by hand, there’s a quicker method: you can “cut and paste” the games into your database. The first steps are exactly as described in the last few posts to this blog – launch Fritz (or one of its related programs), create a new database (if you don’t already have one) to store games in, click “New game” to reset the chessboard, and turn off the chess engine so that it won’t respond to moves. Then you can save the game, typing in the header info (player names, tournament, year, result), information which is not added automatically by the cut and paste process. 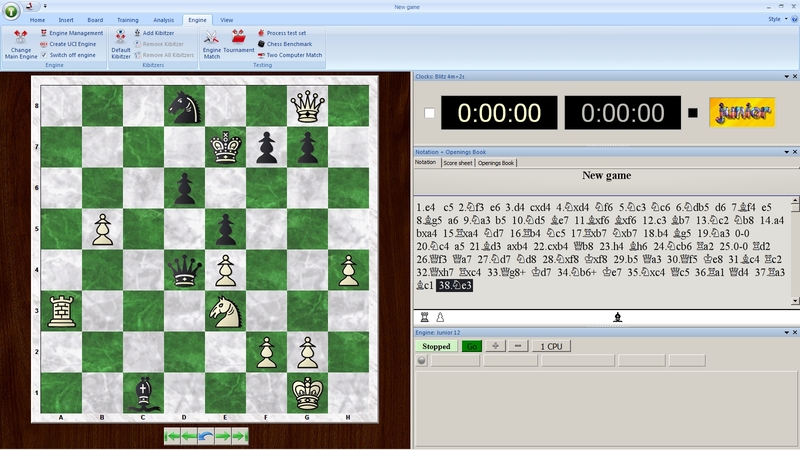 Note that the game’s final comment (“and Black resigned”) is not added by the initial cut and paste operation. We’ll return to text annotations in a minute. …and simply repeat the process for all the variations in the gamescore. And, when you’ve finished adding all of the variations and commentary, don’t forget to save your work (and, as noted above, you can enter the game’s header information at the time you save it). Yes, it’s been a feature since at least ChessBase 7 and Fritz5.32.